Given names: Dmitri Yuriyevich Catherine Grace "Cady" Paolo Angelo Aleksandr Mikhailovich Andrei Ivanovich Ronald John, Jr. Launch from the Baikonur Cosmodrome (Aleksandr Samokutyayev, Andrei Borisenko and Ronald Garan with Soyuz TMA-21). 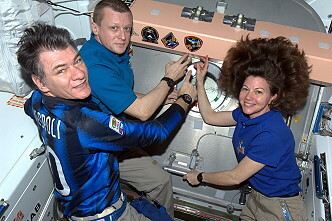 Dmitri Kondratiyev, Paolo Nespoli and Catherine Coleman were onboard since December 17, 2010 (arrival with Soyuz TMA-20). ISS Expedition 27 began with the undocking of spacecraft Soyuz TMA-01M on March 16, 2011 at 04:27 UTC. 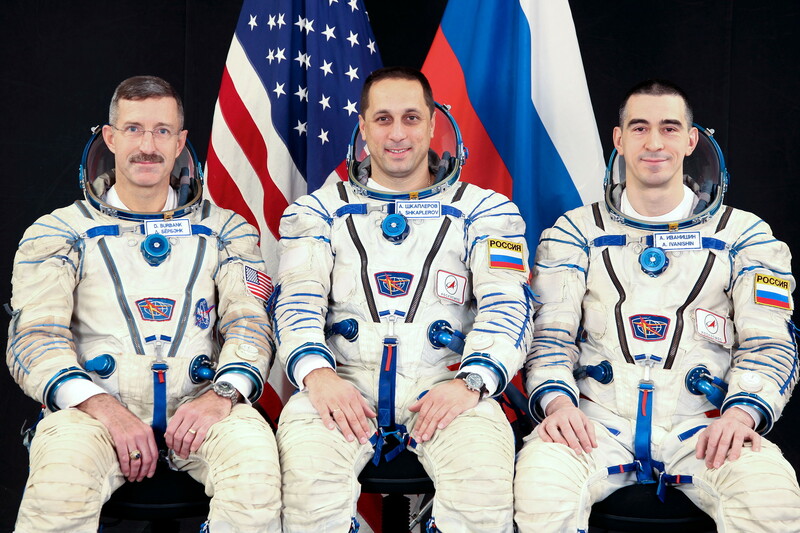 The former Expedition 26 (Scott Kelly, Aleksandr Kaleri and Oleg Skripochka) returned safely to Earth. 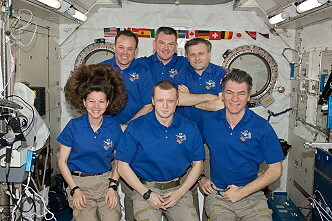 With the arrival of Soyuz TMA-21 on April 06, 2011 at 23:09 UTC the Expedition 27 became a six-person-crew. Soyuz TMA-21 carried Aleksandr Samokutyayev, Andrei Borisenko and Ronald Garan to the space station. 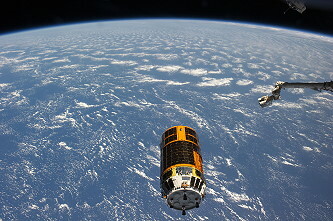 After an extended two-month stay, Kounotori 2 was detached from the nadir docking port of the Harmony module by the Canadarm2 robotic arm at 15:29 UTC on March 28, 2011, and released at 15:46 UTC. Launched in January 2011 to resupply the ISS, Kounotori 2 (also known as HTV-2) was the second Japanese H-II Transfer Vehicle. It reentered Earth's atmosphere at around 03:09 UTC on March 30, 2011. 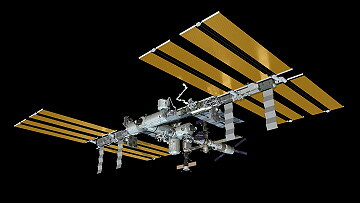 The Progress M-09M cargo spacecraft was undocked from the station's Pirs module at 11:41 UTC on April 22, 2011. After departing the space station, the spacecraft was used for the Radar-Progress scientific experiment to investigate a reflection feature of the plasma generated by operations of the Progress propulsion system. Upon the completion of this experiment, the spacecraft was deorbited, and reentered over the "spacecraft cemetery" in the South Pacific Ocean. 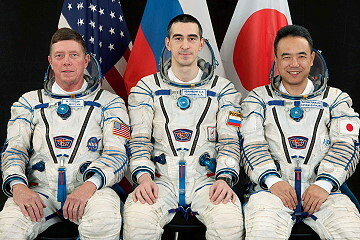 Progress M-09M had been launched on a resupply mission to the ISS on January 28, 2011. It carried 2,666 kilograms (5,880 lb) of cargo to the space station, consisting of 1,444 kilograms (3,180 lb) of dry cargo, 752 kilograms (1,660 lb) of propellant, 50 kilograms (110 lb) of oxygen and 420 kilograms (930 lb) of water. Progress M-10M lifted off at 13:05 UTC on April 27, 2011. Progress M-10M achieved the preliminary planned orbit after nine minutes of the launch. Onboard commands were issued to unfurl the spacecraft's communications and navigation antennas and extend two power-generating solar arrays. Flying two days autonomously after liftoff from the Baikonour Cosmodrome, the Progress M-10M cargo spacecraft arrived at the ISS on April 29, 2011, successfully docking at 14:19 UTC to the nadir port of the Pirs module, which had been vacated by Progress M-09M. The docking occurred as the two spacecraft were traveling 220 miles (354 kilometers) over western Mongolia. The linkup happened just over five hours before NASA's first launch attempt of the Space Shuttle Endeavour on the STS-134 mission. The shuttle launch was scrubbed because of the failure of two heaters on one of Endeavour's auxiliary power units. Endeavour finally launched successfully on May 16, 2011. Progress M-10M undocked nominally at 09:04 UTC on October 29, 2011 from the Nadir port of the Pirs Docking Compartment after hooks open command at 09:01 UTC. An automated 15 seconds separation burn followed at 09:07 UTC. The cargo ship, loaded with trash, performed its 3 minute deorbit burn at 12:10:30 UTC. It entered the Earth's atmosphere at 12:48 UTC and burned up at 12:54 UTC. Surviving debris impacted in the Pacific Ocean at around 13:00 UTC. With the Progress M-10M undocking, the Space Station was in a very rare configuration of having only one Russian vehicle docked (Soyuz TMA-02M at Rassvet Module). The last time this situation occurred was in March 2009. 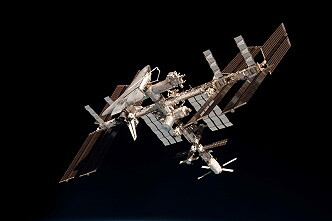 Space Shuttle STS-134 docked with the International Space Station on May 18, 2011. STS-134 (ISS-ULF-6 ELC-3 / AMS) delivered the Alpha Magnetic Spectrometer-2 (AMS), a particle physics detector designed to operate from the station and search for various types of unusual matter. Also onboard for delivery were station spare parts on the ExPRESS Logistics Carrier 3 (ELC-3), including two S-band communications antennas, a high-pressure gas tank, an ammonia tank assembly, circuit breaker boxes, a Canadarm2 computer and a spare arm for the Dextre robot. The ELC-3 also houses a suite of Department of Defense (DoD) experiments that will test systems and materials concepts for long duration spaceflight in low Earth orbit. STS-134 included four spacewalks that focus on station maintenance, experiment swap out and transferring Endeavour's orbiter boom sensor system (OBSS) to the station. The crew left the boom as a permanent fixture to aid future station spacewalk work, if needed. The Alpha Magnetic Spectrometer-2 (AMS) is a state-of-the-art particle physics detector to be delivered to the International Space Station. Using a large magnet to create a magnetic field that will bend the path of the charged cosmic particles already traveling through space, eight different instruments will provide information on those particles as they make their way through the magnet. Armed with that information, hundreds of scientists from 16 countries are hoping to determine what the universe is made of and how it began, as the AMS searches for clues on the origin of dark matter and the existence of antimatter and strangelets. And if that's not enough, there is also the information it could provide on pulsars, blazers and gamma ray bursters and any number of phenomena that have yet to be named. The AMS is not the only experiment looking into these concepts - there are several large, high-energy experiments here on Earth, and a number of telescopes and explorer missions studying the universe from space. But, AMS is unique. Where telescopes - which measure light, whether visible or not - look at space, the AMS will sift through it, measuring cosmic particles. And unlike similar experiments on the ground, its study will not be limited to the particles that make it through Earth's atmosphere or can be artificially created. In space, the AMS will naturally cross paths with particles of energies much higher than those obtainable in accelerators built on the ground. And they will come in much greater quantities, as well. The Earth's atmosphere protects us from the vast majority of the cosmic particles moving through the universe. Sitting on the ground at Kennedy Space Center, the AMS measured an average of 400 particles per second. In space, it is expected to see 25,000 particles per second. What can these particles tell us? That is yet to be seen. The expectation is that they will answer fundamental physics questions. For instance, the Hubble Space Telescope has shown that the visible matter of the universe accounts for only a fraction of the mass needed to explain the current rate of the universe's expansion - about one sixth. One possible explanation for that is that there is a vast amount of matter we cannot see - or dark matter - which increases the total mass of the universe and accounts for the faster expansion. If dark matter exists, the AMS will be able to detect it. For instance, one candidate for the particles that are dark matter is the hypothetical, elementary neutralino particle. If neutralinos exist, their collision could create excesses of electrons and anti-electrons - positrons - that could then be detected by the AMS. The AMS could also detect antimatter and help answer another key question. Antimatter is made up of particles identical to those of regular matter, but with opposite electric and magnetic properties. The Big Bang theory assumes that there were equal amounts of matter and antimatter present when the universe began, in the complex form of helium anti-nuclei or heavier elements has never been found in nature. If it still exists, the AMS should be able to detect it - in the 10 years or more that the AMS will be in operation at the International Space Station, its detectors will see at least one (and possibly many) antihelium nucleus, if such a thing exists. If the detectors never see one, the AMS team will be able to affirm that they do not exist in the visible universe. In studying these and other questions, the AMS brings together two scientific fields that have not historically interacted: astronomers who have seen the effects of these phenomena through their telescopes for centuries and high-energy physicists who have spent decades trying to explain them from the ground. The AMS team hopes to find answers where the two worlds meet. The AMS is composed of a magnet and eight detectors that provide the scientists on the ground with information about the particles that travel through the magnet. All of the information is collected in the nanoseconds it takes a particle to travel through the AMS, and then sent down to scientist on the ground for analysis. At the center - and the heart - of the AMS is the Permanent Magnet. Without it, cosmic particles would fly directly through the detectors in a straight line, offering no clues as to their charge. The Permanent Magnet, which also flew on space shuttle Discovery in the early version of the AMS experiment, is a 1.105 meter by 0.8 meter cylinder made up of more than 6,000 2-by-2-by-1-inch (5-by5-by-2.5 centimeters) blocks of Neodymium-Iron-Boron glued together with epoxy. Neodymium-Iron-Boron magnets are the strongest permanent magnets, providing the AMS with a magnetic field 3,000 times stronger than that of the Earth. However it does not draw the cosmic particles to the International Space Station. In fact, the magnetic draw will not be felt at all, outside of the AMS - otherwise it might change the space station's orientation or draw astronauts to it on spacewalks. STS-134 will carry ELC 3 to the station where it will be placed on the Port 3 truss upper inboard Passive Attachment System (PAS). 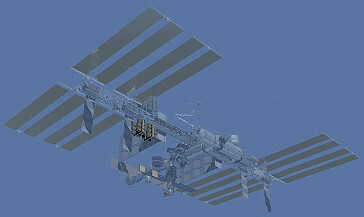 ELC 1 and 2 were placed on the station's truss structure during STS-129. ELC-4 was carried to the station on STS-133 and was installed on the Starboard 3 truss lower inboard PAS. ELC 1 is mounted on the Port 3 truss element Unpressurized Cargo Carrier Attachment System (UCCAS) while ELC 2 was placed on the Starboard 3 truss upper outboard PAS. Remmele Engineering, based in Minneapolis, Minn., built the integral aluminum ELC decks for NASA. Engineers from Goddard Space Flight Center's Carriers Development Office developed the challenging, lightweight ELC design, which incorporates elements of both the ExPRESS Pallet and the Unpressurized Logistics Carrier. Orbital Science Corporation built the ELC. Each ELC can accommodate 12 Flight Releasable Attachment Mechanism (FRAM)-based cargos which includes two payload attached sites with full avionics accommodation. The mass capacity for an ELC is 9,800 pounds (4,445 kg) with a volume of 98 feet (30 meters) cubed. The empty weight of ELC 3 is around 4,000 pounds (1,814 kg). The station provides power to the ELCs through two 3 Kilowatt (kW), 120 Volts direct current (V dc) feeds at the station to ELC interface. The ELC power distribution module converts the 120 V dc power to 120 V dc and 28 V dc. Both power voltages are provided to each payload attached site by separated buses. 120 V dc power is also provided to the other cargo attached site. ELC 3 is the final of four ELCs total to be attached to the station before the scheduled retirement of the space shuttle. Two ELCs attached to the Starboard truss 3 (S3) and two ELCs mated to the Port truss 3 (P3). By attaching at the S3/P3 sites, a variety of views such as zenith (deep space) or nadir (Earthward) direction with a combination of ram (forward) or wake (aft) pointing allows for many possible viewing opportunities. Cargo stationed on the ELC is exposed to the microgravity and vacuum environments of space for extended periods of time while docked to the station, unshielded from incident radiation and orbital debris. ELC 3 contains one site designated to accommodate payloads launched on other missions. NASA uses a system on the external carriers to attach to ORUs and payloads consisting of the Flight Releasable Attachment Mechanism (FRAM). This mechanism has an active side with moving mechanical components, and a passive side that the active side engages with mechanically driven pins and latches. The active FRAM is driven by an EVA astronaut using a Pistol Grip Tool, or the station's robotic arm. These FRAM mechanisms are mounted to the ELC on PFRAM Adapter Plate Assemblies (PFAPs) and also provide an electrical connection that can be used if needed by the ORU or payload being attached. This empty PFRAM will be used for a future payload. The primary function of the Ammonia Tank Assembly (ATA) is to store the ammonia used by the External Thermal Control System (ETCS). The major components in the ATA include two ammonia storage tanks, isolation valves, heaters, and various temperature, pressure and quantity sensors. There is one ATA per loop located on the zenith side of the Starboard 1 (Loop A) and Port 1 (Loop B) truss segments. Each is used to fill their respective ETCS loop on startup (loops are launched with nitrogen in the lines) and to supply makeup fluid to that loop. It also assists the Pump Module (PM) accumulator with ammonia inventory management, and provides the capability to vent the PM and ATA by connection to an external nonpropulsive vent panel. The length is 57 inches (145 centimeters) by 80 inches (203 centimeters) width with a height of 45 inches (114 centimeters). A new ATA, with 600 pounds (272 kg) of Ammonia, weighs approximately 1,702 pounds (772 kg). ELC 3 will carry a Cargo Transportation Container (CTC) 2 that will contain 10 Remote Power Controller Modules (a large circuit breaker box) and 11 RPCM ORU Adapter Kits (OAKs) - basically brackets installed in the CTC to hold the ORUs. The empty RPCM OAK is used for a "fast swap" as the RPCM has a limited thermal clock, this allows the arm to remove the bad RPCM first, open the lid, place that in the blank spot, grab the replacement and install it in the shortest amount of time. In addition, the CTC will contain an Arm Computer Unit (ACU) ORU. The ACU is the heart of the computer subsystem of Canadarm2 - the station's Canadian-built robotic arm. The ACU is programmed to receive and process commands from the station crew or from ground control for moving Canadarm2. The ACU is being launched on STS-134 to add to the inventory of Canadian pre-positioned spares in orbit. High pressure oxygen onboard the space station provides support for EVAs and contingency metabolic support for the crew. This high pressure O2 is brought to the station by the High-Pressure Gas Tanks (HPGTs) and is replenished by the space shuttle by using the Oxygen Recharge Compressor Assembly (ORCA). There are several drivers that must be considered in managing the available high pressure oxygen on the station. The amount of oxygen the space shuttle can fly up is driven by manifest mass limitations, launch slips; and in-orbit shuttle power requirements. The amount of oxygen that is used from the station's HPGTs is driven by the number of shuttle docked and undocked EVAs, the type of EVA prebreathe protocol that is used, contingency use of oxygen for metabolic support, and emergency oxygen. The HPGT will be transferred from ELC 3 to the Quest airlock. The HPGT measures 5 feet (13 centimeters) by 6.2 feet (16 centimeters) by 4.5 feet (11 centimeters) and weighs approximately 1,240 pounds (563 kg) of which 220 pounds (100 kg) is gaseous oxygen at 2,450 pounds (1,111 kg) per square inch of pressure. The HPGT was provided by Boeing. The S-band Antenna Support Assembly (SASA) is an assembly that consists of the Assembly Contingency Radio Frequency Group (RFG, or ACRFG), SASA Boom and Avionics Wire Harness. The SASA supports the RFG in each of the two redundant strings of S-Band hardware on the Port 1 (P1) and Starboard 1 (S1) trusses. The major functions of the RFG are to receive a modulated radio signal from the S-band Transponder, amplify it to a power level necessary to be acquired by the Tracking Data and Relay Satellite (TDRS), and broadcast that signal through the selected antenna. Also, the RFG receives a signal from the TDRS through the antenna, amplifies it, and sends it to the Transponder for demodulation. The RFG consists of three units: the Assembly / Contingency (S-Band) Transmitter/Receiver Assembly (ACTRA), a High Gain Antenna (HGA), and a Low Gain Antenna (LGA). The SASA boom assembly consists of a mast, an EVA handle, a harness, a connector panel, a mounting surface for the RFG, and a baseplate fitting. The baseplate fitting is the structural interface for mounting the SASA to the truss on the station. The Avionics Wire Harness is installed on the SASA Boom Assembly. Through the harness, operational and heater power are provided to the RFG; command and status signals and RF transmit and receive signals are sent to and from RFG. The total envelope of the RFG is 36" × 59" × 33" (91 x 150 x 84 centimeters) (maximum dimensions). The SASA boom is 61" × 30 ¼" × 43". (155 x 77 x 109 centimeters). The entire SASA weighs 256 pounds (113 kg). The unit that is being flown on this mission was provided by MacDonald Dettwiler and Associates Ltd. (MDA). STS-134 will deliver a spare arm for Dextre to the station. The spare is 11.5 feet (3.51 meters) long with seven joints and a load-carrying capability of 1,320 pounds (600 kg). The seven joints provide the arm with the flexibility to grasp difficult-to-reach ORUs. It is equipped with an Orbital Tool Changeout Mechanism (OTCM) at the end of the arm to hold different types of tools. It also has a camera and light that provide imagery of robotic targets. ORUs removed by Dextre are temporarily stored on a platform (Enhanced ORU Temporary Platform) attached to robot's body. After the hatches are opened between the two spacecraft, STS-134 crew began working with the ISS Expedition 27. Once the hatches were open, the joint crew held a welcome ceremony and completed a safety briefing. The same day Express Logistics Carrier-3 (ELC-3), was handed off from shuttle Endeavour's robotic arm to the International Space Station arm and attached to the left side of the station's truss structure. ELC-3 holds spare hardware for future station use, including an ammonia tank, a high pressure gas tank, a cargo transport container, two S-band antenna assemblies and a spare arm for Dextre, the Special Purpose Dexterous Manipulator. On May 19, 2011 the Alpha Magnetic Spectrometer-2 (AMS) was installed successfully on the outside of the International Space Station's right side. Mission Specialists Andrew Feustel and Roberto Vittori used the space shuttle's robotic arm to extract it from Endeavour's payload bay. They handed it off to the space station's Canadarm2, and Pilot Gregory Johnson and Mission Specialist Gregory Chamitoff then used the robotic arm to install AMS on the starboard side of the station's truss. 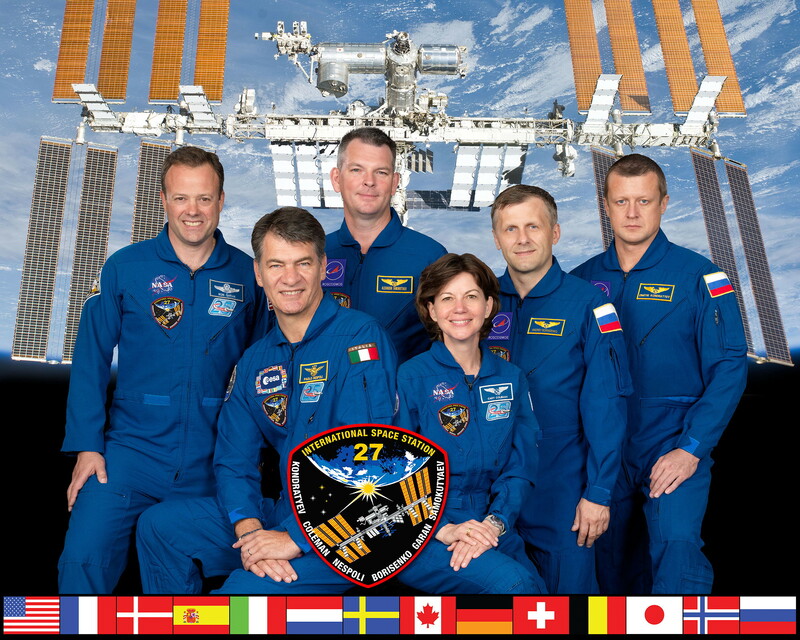 While this was going on, Expedition 27 crew members Paolo Nespoli, Catherine Coleman and Ronald Garan assisted the rest of the STS-134 crew in completing transfers to and from Endeavour. Late in the crew day, the two crews performed an EVA procedures review. After the review, Gregory Chamitoff and Andrew Feustel camped out in the Quest Airlock overnight, in preparation for the mission's first spacewalk. The campout was done with the airlock's air pressure reduced, so as to purge nitrogen bubbles from the astronauts' blood and thus prevent decompression sickness. The first EVA by Andrew Feustel and Gregory Chamitoff occurred on May 20, 2011 (6h 19m). They retrieved two experiments and install a new package of experiments on ELC-2, which is already on the station. Next they installed jumpers between segments on the left-side truss, or backbone of the station, for ammonia refills; vent nitrogen from an ammonia servicer; and installed an external wireless communication antenna on the Destiny laboratory that will provide wireless communication to the Express Logistics Carriers mounted on the station's truss. The first spacewalk of the STS-134 mission had the most variety. Andrew Feustel and Gregory Chamitoff started out by making their way to the ExPRESS Logistics Carrier 2 on the starboard side of the station's truss to retrieve two Materials International Space Station Experiments - MISSEs 7A and 7B. They were delivered to the station in November 2009 and installed during one of the STS-129 spacewalks. To remove the experiments, Gregory Chamitoff disconnected one power cable from each of them. He then closed the experiment and removed two pins holding MISSE 7B in place and carried it back to Endeavour's cargo bay for returned home. Andrew Feustel did the same with 7A. The two experiments returning home were stored opposite from each other on the side of the shuttle's cargo bay and secured using two latches. When they were in place, Andrew Feustel retrieved MISSE 8, brought up by Endeavour, and carried it back to the ExPRESS Logistics Carrier 2 for installation in 7A's place. He installed two pins to hold the experiment in place, opened the experiment and hooked up two power cables. While he did so, Gregory Chamitoff installed a Crew Equipment and Translation Aid cart light on the S3 segment of the station's truss. He used one bolt to secure the light to the cart, and hooked up one power cable. Afterward, before he left the area, he installed a cover on one face of the S3 solar alpha rotary joint. It was removed during a November 2007 spacewalk, and held in place with six bolts. Andrew Feustel and Gregory Chamitoff's next task was to prepare for the work Andrew Feustel and Michael Fincke performed on the mission's second spacewalk to top off the ammonia in the station's P6 photovoltaic thermal control system cooling loop. The loop had a slow ammonia leak. They started by installing a jumper cable that connect the cooling loops of the P4 segment of the station's truss to the P3 segment, and then venting nitrogen from the loops between P1 and P5. They also vented nitrogen from the jumper that connects the ammonia reservoir they was used for the refill to P6. When that was done, they moved on to the Destiny laboratory, where they were installing antennas for the External Wireless Communication (EWC) system. Andrew Feustel worked on routing the cables it connected to, while Gregory Chamitoff sets up the antenna. To do so, Gregory Chamitoff first removed two handrails on Destiny and replaced them with EWC handrails, which have the antennas integrated into them. Each handrail is held in place by two bolts. Once the antenna handrails were installed, Gregory Chamitoff connected two power cables, and Andrew Feustel connected three more and stored two additional cables for future use. Andrew Feustel wrapped up the first spacewalk of the mission by getting tools and equipment that were used in the second and third spacewalks ready. The second EVA was performed by Andrew Feustel and Michael Fincke on May 22, 2011 (8h 07m). The astronauts refilled radiators with ammonia. They also completed venting the early ammonia system, lubricated a left-side solar joint and parts of Dextre, a two-armed space station robot capable of handling delicate assembly tasks currently performed by spacewalkers. Andrew Feustel and Michael Fincke worked on two major projects during the second spacewalk of the mission: refilling one of the station's cooling loops with ammonia, and lubricating one of the station's massive Solar Alpha Rotary Joints (SARJs). The works of the first spacewalk mean that Andrew Feustel and Michael Fincke had only a small amount of preparation left for the ammonia refill task. They first finished rerouting the cables, so that there was a continuous open line from the P1 segment of the station's truss where the extra ammonia is stored in ammonia tank assemblies, to the P6 section where the leaky loop was. The flight controllers on the ground in Houston performed a leak check of the line the refill began. It took about 10 minutes, during which about 5 pounds (2.3 kg) of ammonia was added to the cooling loop. Once the refill was complete, Andrew Feustel vent the remaining ammonia from the jumper cables the spacewalkers installed, and then removed the cables. This was done in two parts - the first vent the ammonia between P1 and P5 and lasted about 17 minutes. Afterward, Andrew Feustel vents the jumper cable on P6, which only took about four minutes. Meanwhile, Michael Fincke moved to the SARJ on the P3 segment of the station's truss. In 2007, its starboard-side counterpart was found to be grinding against itself, and so lubrication was added to both joints during the spacewalks of the STS-126 mission. The lubrication has been working very well, and Michael Fincke and Andrew Feustel were replenishing on the port side as part of the second spacewalk of the mission. The rotary joint has 22 protective insulation covers. Michael Fincke started off the work by opening covers 12, 13, 16, 17, 8 and 9. He inspected the area under one of the covers, taking photos and wiping the surface of the joint to collect samples of the remaining grease from the previous lubrication. Then, Michael Fincke used one grease gun with to add grease to the inner canted surface and another gun for the outer canted and datum A surfaces. When Michael Fincke was finished with lubricating beneath the first set of covers, he rejoined Andrew Feustel to finish up putting the port cooling loops back into their original configuration. Once complete, flight controllers on the ground in Houston rotated the port SARJ 200 degrees to spread the grease. That rotation took about an hour, giving Michael Fincke time to install two radiator grapple bar stowage beams on the S1 segment of the station's truss. The beams are used to store handles that would be necessary if a radiator ever needed to be replaced. Meanwhile, Andrew Feustel got into place for his work with the Special Purpose Dexterous Manipulator, or Dextre. The station's robotic arm brought Dextre to Andrew Feustel, so that Andrew Feustel could install a cover on one of the robot's cameras and lubricate the snares that allow the robot to grab onto equipment. By the time those tasks were finished, the port SARJ were in place for its second round of lubrication. Andrew Feustel and Michael Fincke worked together on the task this time, and when they were done, they reinstalled the covers on the joint before making their way back to the Quest airlock. 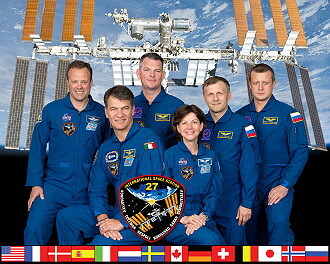 After the STS-134 crew went to bed, the Expedition 27 crew prepared for their departure. Expedition 27 Commander Dmitri Kondratiyev and Flight Engineers Paolo Nespoli and Catherine Coleman left the ISS aboard the Soyuz TMA-20 spacecraft at 21:45 UTC. The departure of the three Expedition 27 crew members marked the start of Expedition 28, leaving the new Expedition Commander Andrei Borisenko and Flight Engineers Aleksandr Samokutyayev and Ronald Garan aboard the station. 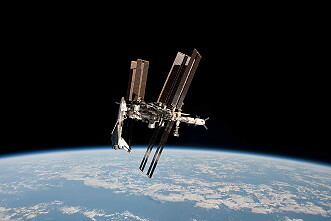 Before re-entry, Soyuz TMA-20 performed a special fly-about of the ISS, taking numerous photographs of the station and Space Shuttle Endeavour. Soyuz TMA-20 and the Expedition 27 crew landed safely in central Kazakhstan at 02:26 UTC on May 24, 2011. The third EVA was again performed by Andrew Feustel and Michael Fincke on May 25, 2011 (6h 54m) to install a grapple, or handle for the robotic arm on the station to grab, on the Zarya module to support robotic operations based from the Russian segment. They also installed additional cables to provide backup power to the Russian portion of the space station. The work of the third spacewalk centered around increasing redundancy in the power supply to the Russian side of the station and extending the reach of the station's robotic arm to that area. 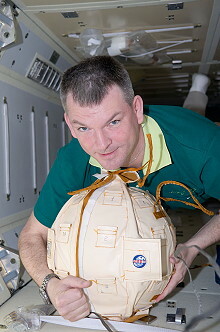 The latter was achieved by adding a power and data grapple fixture to the exterior of the Zarya module. That allows the arm to "walk" to Russian segment, using that grapple fixture as a base. The spacewalk started with Andrew Feustel and Michael Fincke doing some setup work at the Zarya module, moving tools and equipment into place and removing caps covering the installation location. They then returned to the Quest airlock and brought out the grapple fixture and the interface equipment that it attached to, which is called the PAMA. The size of the hardware required both spacewalkers to carry it together. Once they arrived back at Zarya, they installed the PAMA, which the grapple fixture was already be attached to. This required twisting its three "feet" into place on the exterior of Zarya. With the fixture installed, Andrew Feustel and Michael Fincke moved on to setup work. They started by installing a video signal converter nearby. Michael Fincke secured it using one bolt, while Andrew Feustel connected three cables between the converter and the grapple fixture. Michael Fincke then connected one final cable and installed insulation on the converter. There then were a number of cables to connect the grapple fixture to the rest of the station. There were two power cables to connect and two data cables to install. The majority of the rest of the spacewalk was devoted to installing jumper cables that will add an extra level of redundancy to the system that provides the Russian side of the space station with power. These cables ran from the Harmony node, to the Unity node, to the Zarya module. On flight day 11, the crew of Space Shuttle Endeavour conducted a late inspection of the orbiter's Thermal Protection System. On most previous flights, this inspection was performed after the shuttle undocked from the ISS. However, in this case it was done early, because the Orbiter Boom Sensor System (OBSS) was to be left on board the ISS after Endeavour's departure. The fourth and final EVA by Michael Fincke and Gregory Chamitoff occurred on May 27, 2011 (7h 24m). Michael Fincke and Gregory Chamitoff stowed the shuttle's 50-foot (15 meters) boom on the right-side truss on a permanent stowage fixture, retrieved the grapple from the station's left-side truss and used it as a replacement for the grapple currently on the boom. They then released restraints from one of the arms on Dextre and replaced thermal insulation on one of the spare gas tanks for the Quest airlock. The bulk of the work on the final spacewalk of the STS-134 mission focused on getting the shuttle's OBSS stored on the space station's truss system and ready for use by the station's robotic arm. The arm has proven useful in the past for providing additional reach on spacewalk tasks and could come in handy in other areas, as well, so rather than send it home on the space shuttle, it will stay behind when Endeavour leaves. The spacewalk started with the station's robotic arm taking the boom off the hands of the shuttle robotic arm. While Michael Fincke and Gregory Chamitoff made their way out of the Quest airlock, Gregory Johnson and Catherine Coleman then maneuvered the boom into position for them on the starboard side of the station's truss, where stanchions held it in place. Michael Fincke and Gregory Chamitoff simply locked the boom into place. Afterward, Michael Fincke connected two grounding connectors, while Gregory Chamitoff installed a foot restraint on the station's robotic arm for use later in the spacewalk. From there, both spacewalkers moved to the P6 segment of the station's truss to retrieve a power and data grapple fixture for installation on the boom. Currently, a grapple fixture in the middle of the boom is the only one that the station arm is able to use, which halves the reach of the boom when on the station's arm. To remedy this, Michael Fincke and Gregory Chamitoff replaced an electrical flight grapple fixture currently on one end of the boom with a power and data grapple fixture that the station arm can use. To retrieve the power and data grapple fixture, Michael Fincke and Gregory Chamitoff worked together to release four bolts holding it in place. Gregory Chamitoff then climbed onto the station's robotic arm for a ride back to boom on the starboard side of the station's truss. There, Gregory Chamitoff, with assistance from Michael Fincke, released the six bolts holding the electrical flight grapple fixture to the boom and cut its cable. Then he installed an adapter assembly on the boom, using six bolts and slided the power and data grapple fixture into place on it. Four bolts held it in place. Afterward, Gregory Chamitoff climbed off of the robotic arm, while Michael Fincke stowed the electrical flight grapple fixture in Endeavour's cargo bay, and the two moved onto their work on a spare arm for Dextre. The arm was delivered on ExPRESS Logistics Carrier 3, where three expandable diameter fixture bolts had held it in place for launch. Michael Fincke and Gregory Chamitoff released each of the bolts, making use of a specially designed pry rod. The final spacewalking task of the mission was performed by Gregory Chamitoff. He installed insulation on the grapple fixture of the high pressure gas tank delivered by Endeavour on ExPRESS Logistics Carrier 3. Flight day 13 saw the members of the STS-134 crew complete several major tasks. Mission specialists Michael Fincke and Gregory Chamitoff replaced an absorbent bed in the Carbon Dioxide Removal Assembly (CDRA). The beds have to be changed from time to time in order for the CDRA to remove CO2. While the CDRA work was on-going, commander Mark Kelly and mission specialist Andrew Feustel re-sized two of the spacesuits that will be used by Expedition 28 Flight Engineers Ronald Garan and Michael Fossum. The rest of the STS-134 crew completed more transfers between space shuttle Endeavour and the International Space Station (ISS). The transfer of supplies and equipment was completed on flight day 14, with the transfer of 4 bags of water from the shuttle to the ISS. Mission specialist Michael Fincke completed the work on the Carbon Dioxide Removal Assembly (CDRA) that he and Gregory Chamitoff had started the day before. Gregory Chamitoff was joined by Andrew Feustel to finish stowing tools that had been used during the mission's four spacewalks. Space shuttle Endeavour's small vernier thrusters were used to raise the ISS by about 3,150 feet (960 m). The later part of the crew day saw the Expedition 28 crew hold a farewell ceremony for the STS-134 crew. After the two crews said their farewells to one another, they got into procedures to close the hatches on the ISS and space shuttle. After the hatches were closed and secured, a series of leak checks were performed on both vehicles, and the Pressurized Mating Adapter 2 (PMA 2) was depressurized. The hatch closures marked the end of joint operations. 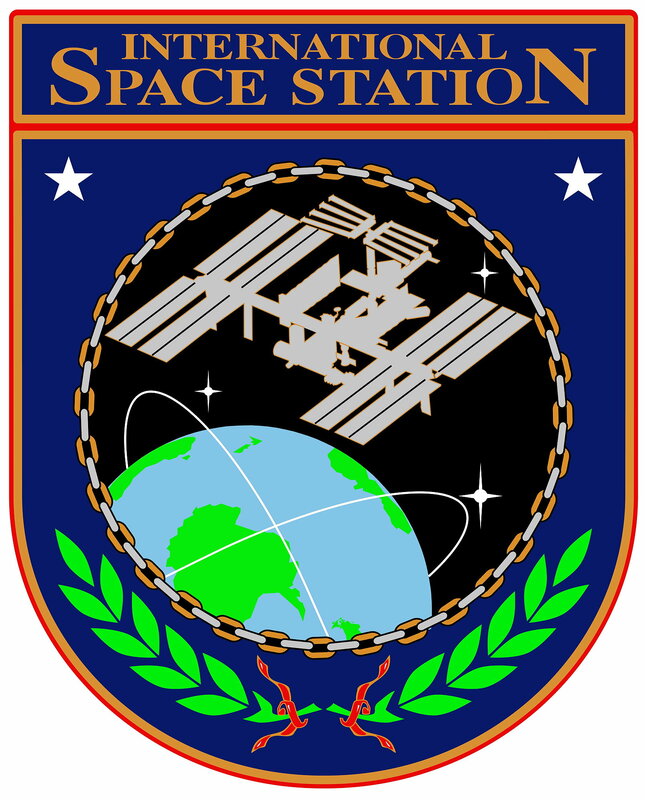 The STS-134 mission delivered the Materials on International Space Station Experiment 8 (MISSE) experiments, and returned the completed MISSE 7 experiments to Earth. MISSE 7 had been delivered to the ISS on STS-129 in 2009. STS-134 carried a new Glacier module to the ISS and returned two old ones to Earth. The Glacier units were used to store and return science samples on the space shuttle. Endeavour brought 13 Lego kits to the ISS, where astronauts built Lego models to see how they would react in microgravity, as part of the Lego Bricks in Space program. The results were shared with schools as part of an educational project. On May 30, 2011 STS-134 undocked from the ISS and moved to a distance of about 450 feet (137.2 meters), where Gregory Johnson began to fly around the station. Endeavour circled the shuttle around the station at a distance of about 600 feet (182.9 meters). The shuttle crew took detailed photographs of the external structure of the station, which served as important documentation for the ground teams in Houston to monitor the orbiting laboratory. Once the shuttle completed 1.5 revolutions of the complex, Gregory Johnson fired Endeavour's jets to leave the area. Nearly two hours after undocking a second firing of the engines, which would normally take the shuttle further away, served as the first maneuver to bring Endeavour back toward the station for the STORRM. The test characterized the performance of sensors in Endeavour's payload bay and acquisition of reflectors on the shuttle's docking target at the station. The re-rendezvous mimic the Orion vehicle's planned rendezvous trajectory and approached no closer than 600 feet (182.9 meters) to the station. Endeavour approached the station to a point 1,000 feet (304.8 meters) below and 300 feet (91.4 meters) behind the station at its closest point at 450 feet (137.2 meters). Nearly five hours after undocking, Endeavour's engines fired again to depart the station's vicinity. The shuttle began to increase its distance behind the station with each trip around the Earth while ground teams analyzed data from the late inspection of the shuttle's heat shield. However, the distance was close enough to allow the shuttle to return to the station in the unlikely event that the heat shield is damaged, preventing the shuttle's safe re-entry. The Expeditions 27 / 28 crews worked with 111 experiments involving approximately 200 researchers across a variety of fields, including human life sciences, physical sciences and Earth observation, and conduct technology demonstrations ranging from recycling to robotics. Seventy-three of these experiments are sponsored by NASA, including 22 under the auspices of the U.S. National Laboratory program, and 38 are sponsored by international partners. More than 540 hours of research are planned. As with prior expeditions, many experiments are designed to gather information about the effects of long-duration spaceflight on the human body, which will help us understand complicated processes such as immune systems with plan for future exploration missions. An important new instrument, the Alpha Magnetic Spectrometer (AMS-02), was delivered to the station by the space shuttle Endeavour on the STS-134 mission. AMS-02 is a state-of-the-art particle physics detector constructed, tested and operated by an international team composed of 60 institutes from 16 countries and organized under the United States Department of Energy (DOE) sponsorship. It will use the unique environment of space to advance knowledge of the universe and lead to the understanding of the universe's origin by searching for antimatter, dark matter and measuring cosmic rays. Experimental evidence indicates that our galaxy is made of matter; however, there are more than 100 million galaxies in the universe and the Big Bang theory of the origin of the universe requires equal amounts of matter and antimatter. Theories that explain this apparent asymmetry violate other measurements. Whether or not there is significant antimatter is one of the fundamental questions of the origin and nature of the universe. AMS-02 will operate on the space station's external truss structure for three years, gathering an immense amount of accurate data and allowing measurements of the long-term variation of the cosmic ray flux over a wide energy range, for nuclei from protons to ions. After the nominal mission, AMS-02 may continue to provide cosmic ray measurements that will help researchers understand what radiation protection is needed for human interplanetary flight. The arrival of the Permanent Multipurpose Facility, an Italian-built converted pressurized cargo carrier named Leonardo, has added 2,700 cubic feet (76.5 cubic meters) of pressurized volume to the orbiting laboratory, increasing the total habitable volume of the station to 13,846 cubic feet (392.1 cubic meters). Three science facilities recently delivered or activated on the station will be used in a variety of investigations: the Boiling Experiment Facility (BXF) is supporting microgravity experiments on the heat transfer and vapor removal processes in boiling. The eighth Expedite the Processing of Experiments to Space Station (ExPRESS) rack was delivered and installed on the STS-133 space shuttle mission and is being activated to support a variety of experiments in the Destiny Laboratory module. The Light Microscopy Module (LMM) is undergoing initial testing as a device to examine samples from experiments without requiring that they be returned to Earth, experiencing the effects of re-entry from orbit. The microscope is isolated from vibrations on the station, allowing it to obtain clear, high-resolution images of microorganisms and individual cells of plants and animals, including humans. The biological samples for the LMM were launched on space shuttle Discovery's STS-133 mission, and included eight fixed slides containing yeast; bacteria; a leaf; a fly; a butterfly wing; tissue sections and blood; six containers of live C. elegans worms, an organism biologists commonly study; a typed letter "r" and a piece of fluorescent plastic. Some of the worms are descendants of those that survived the space shuttle Columbia (STS-107) accident; and others are modified to fluoresce. A Japanese experiment will continue to look at one factor in the way fluid moves, called Marangoni convection. This type of convection is manifested on Earth in the way that "legs" or "tears of wine" form on the inside of a glass. This ring of clear liquid that forms near the top of a glass above the surface of wine, then forms rivulets that fall back into the liquid, illustrates the tendency for heat and mass to travel to areas of higher surface tension within a liquid. To study how heat and mass move within a fluid in microgravity, investigators are using a larger bridge of silicone oil between two discs. 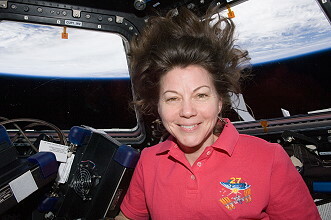 In microgravity on the space station, warm air does not rise and cold air does not sink, which allows investigators to heat one disc more than the other to induce Marangoni convection in that bridge of silicone oil to learn more about how heat is transferred in microgravity. A suite of European Space Agency experiments will look at other convection processes large and small, using aluminum alloys, a standard cast metal used in a number of automotive and transportation applications. The Materials Science Laboratory ? Columnar-to-Equiaxed Transition in Solidification Processing (CETSOL) and Microstructure Formation in Casting of Technical Alloys under Diffusive and Magnetically Controlled Convective Conditions (MICAST) are two investigations that will examine different growth patterns and evolution of microstructures during crystallization of metallic alloys in microgravity. CETSOL will give industry confidence in the reliability of the numerical tools used in casting, while MICAST will study microstructure formation during casting under diffusive and magnetically controlled convective conditions, and the Solidification along a Eutectic path in Ternary Alloys (SETA) experiment will look into a specific type of growth in alloys of aluminum manganese and silicon. Another interesting investigation is the Shape Memory Foam experiment, which will evaluate the recovery of shape memory epoxy foam in microgravity. The investigation will study the shape memory properties needed to manufacture a new-concept actuator that can transform energy to other forms of energy. The investigations cover human research; biological and physical sciences; technology development; Earth observation, and education. In the past, assembly and maintenance activities have dominated the available time for crew work. But, as completion of the orbiting laboratory nears, additional facilities and the crew members to operate them are enabling a measured increase in time devoted to research as a national and multi-national laboratory. State-of-the-art computers and communications equipment deliver up-to-the-minute reports about experiment facilities and investigations between science outposts across the United States and around the world. The payload operations team also synchronizes the payload timelines among international partners, ensuring the best use of valuable resources and crew time. The ERB-2 is a high definition 3D stereoscopic video camera which will be used for taking footage inside the ISS to develop narrated video material for promotional and educational purposes . MARES will carry out research on musculo-skeletal, bio-mechanical, and neuro-muscular human physiology. Results will provide a better understanding of the effects of microgravity on the muscular system and an evaluation of relevant countermeasures. ECG data of ISS crew members will be recorded continuously through 24-hour by a commercial Holter ECG recorder in this Biological Rhythms project. The recordings will be performed once in pre-flight time, three times in flight and once in post-flight. The data from the flight time will be downlinked to the ground after measurement. With these data, cardiovascular and autonomic functions are analyzed, and also be used to evaluate Biological Rhythm fluctuations and crew members' heart resting quality while they sleep on board the ISS. The results come from this experiment will be applied to improving health care technologies for the ISS crew. It has been hypothesized that an auxin efflux facilitator, CsPIN1, plays an important role in regulation of gravity-dependent auxin redistribution and controls gravimorphogenesis of cucumber (Cucmis sativus L.) seedlings. In addition, gravitropism interferes with hydrotropism in cucumber roots on the ground, in which CsPIN5 may play a role. In this space experiment, we will use cucumber seedlings to analyze the effect of gravity on the localization of CsPIN1 protein and unravel its contribution to peg formation. At the same time, we will differentiate hydrotropism from gravitropism in cucumber roots and investigate the localization of CsPIN5 protein to figure out the interacting mechanism between the two tropisms. BIOKon In Space (BIOKIS) involves the investigation of seven experiments sponsored by the Italian Space Agency (ASI-Agenzia Spaziale Italiana) in the areas of cellular biology, radiation and radioprotection, aging, germination and plant growth. These experiments will aim to evaluate various biological species to determine genetic distinctions following short-duration space flight; also, BIOKIS will utilize a variety of dosimeters to monitor radiation. Commercial Biomedical Test Module - 3 (CBTM-3) will use a validated mouse model to examine the effectiveness of an experimental therapeutic as a possible countermeasure for muscle atrophy. Combined with exercise, this experimental therapeutic developed by Amgen could one day form the basis for a treatment that will help maintain a high level of physical fitness in future flight crews. Also, through an extensive tissue sharing program several additional investigations will be performed on the effects of microgravity on the skeletal, cardiovascular, immune systems, liver and kidney function as well as other physiological systems. 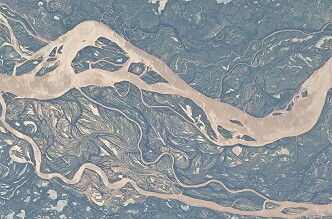 The International Space Station Agricultural Camera (ISSAC) will take frequent images, in visible and infrared light, of vegetated areas on the Earth, principally of growing crops, rangeland, grasslands, forests, and wetlands in the northern Great Plains and Rocky Mountain regions of the United States. Images will be delivered directly to requesting farmers, ranchers, foresters, natural resource managers and tribal officials to help improve their environmental stewardship of the land. Images will also be shared with educators for classroom use. The Lego Bricks payload is a series of toy Lego kits that are assembled on orbit and used to demonstrate scientific concepts. Some of these models include satellites, a space shuttle orbiter, and a scale model of the International Space Station (ISS). Eyespots and Macular Pigments Extracted from Algal Organisms Immobilized in Organic Matrix with the Purpose to Protect Astronaut's Retina (Night Vision) is a study on the response of microalgae strains (that contain eye spots similar to the human retina) to space radiation in order to obtain results applicable to future nutrition programs for astronauts. The Plant Signaling experiment studies the effects of microgravity on the growth of plants. The experiment is performed on board the International Space Station (ISS) in collaboration with the European Space Agency (ESA). Images of the plants are captured and down-linked to Earth. Samples of the plants are harvested and returned to Earth for scientific analysis. The results of this experiment can lead to information that will aid in food production during future long duration space missions, as well as data to enhance crop production on Earth. Sprint (Integrated Resistance and Aerobic Training Study) evaluates the use of high intensity, low volume exercise training to minimize loss of muscle, bone, and cardiovascular function in ISS crew members during long-duration missions. The Biomechanical Analysis of Treadmill Exercise on the International Space Station (Treadmill Kinematics) experiment is the first rigorous investigation to quantify the biomechanics of treadmill exercise conditions during long duration spaceflight on the ISS. Exercise prescriptions have been developed under the assumption that walking and running in microgravity have the same training effects as during normal gravity. However, if locomotion kinematics and kinetics differ between microgravity and normal gravity, understanding these mechanisms will allow the development of appropriate exercise prescriptions to increase exercise benefits to crew health and well-being. Radar-Progres: Investigation of ground-based observations of reflection characteristics of plasma irregularities in the ionosphere generated by the onboard engines of the Progress. Finally the station command changed from Russian cosmonaut Dmitri Kondratiyev to Russian cosmonaut Andrei Borisenko. 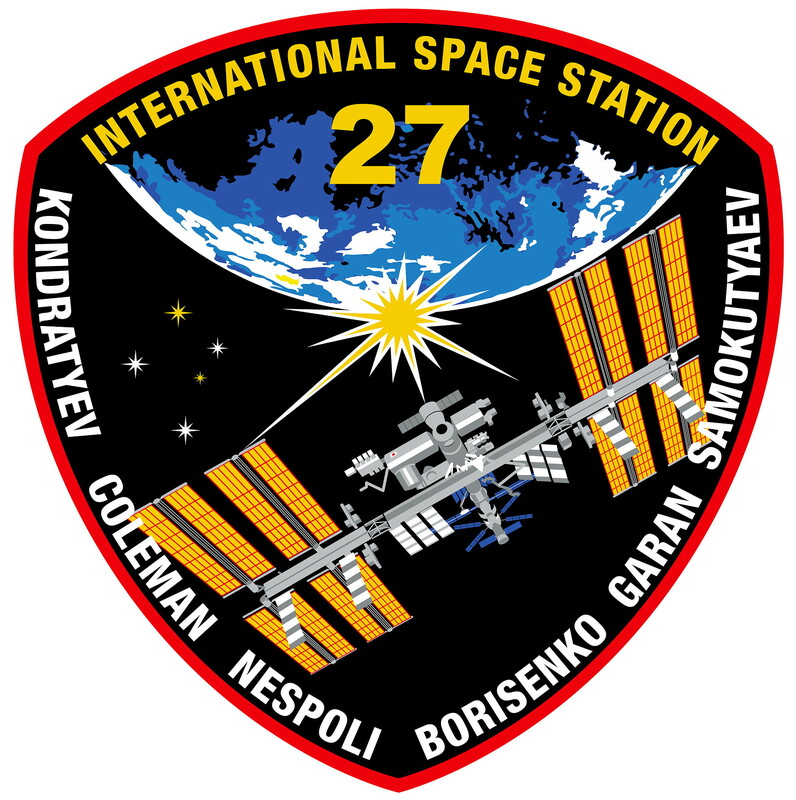 With undocking of Soyuz TMA-20, carrying Dmitri Kondratiyev, Paolo Nespoli and Catherine Coleman on May 23, 2011 at 22:45 UTC the Expedition 27 concluded and the new ISS Expedition 28 began.